Sometimes 25" is just not enough space for your presentation graphics. This is where wide format laminators come into play. These laminators are ideal for use with large applications such as promotional signs, banners, trade show graphics, and so much more. They are floor standing models, (some can be placed on a table) that can handle documents anywhere from 42" - 63" wide. Ideal for any size printed projects, wide format laminators can be used with thermal capabilities to heat glue activated thermal laminating film. Cold laminators work by applying a pressure sensitive film to laminate projects that a thermal laminator could damage. A perfect example is wax-based ink that can be melted by heat. A wide format cold laminator will also prevent bleeding. Certain wide format laminators can be used in either thermal or cold settings allowing you to do both lamination types in with one machine. Most wide format laminators also offer mounting capabilities so your laminated project can be mounted to a mounting board. Proper laminating and finishing is an essential step in wide-format print production. Lamination protects prints from moisture and abrasion, adds resistance to light fade and effects of ozone, increases rigidity, and increases aesthetic value. Finishing (mounting, trimming, addition of grommets, etc.) ensures the print fits the requirements of the application. We have compiled some information that we find explains the details of wide format laminating in a way that any user will understand. These tips and suggestions are based on years of experience in the lamination industry, however, you should always test specific applications to ensure the best results. 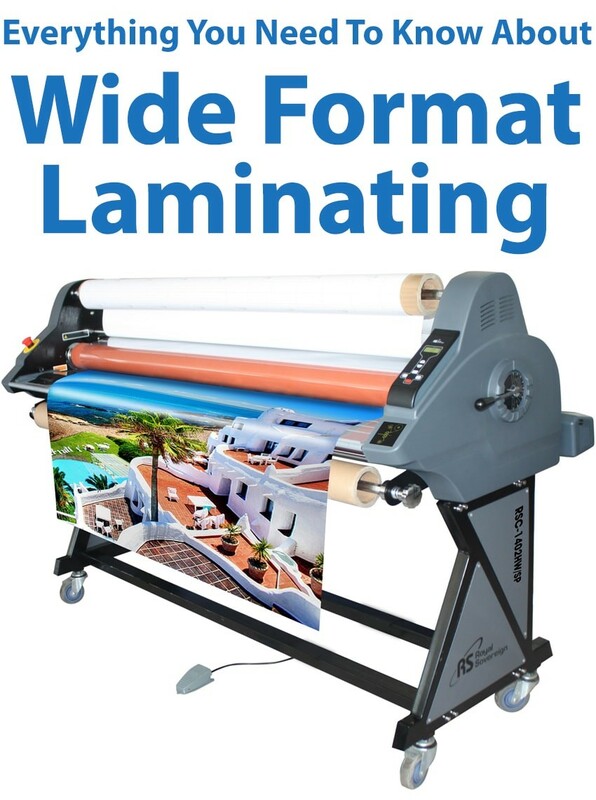 • Some Wide Format Laminators require set-up and training. There are many factors to consider when choosing the correct wide format laminate for your application. There are different temperature ranges at which the film is designed for, different thicknesses, material types, surface characteristics, and film to adhesive ratios to consider. To determine the best method for your application and laminating equipment check with the laminate manufacturer for the proper material and be sure to test all materials before completing an actual job. Surface: Laminates are available in a variety of surfaces, including matte, textured, lustre, and glossy. The way your display will be lit usually determines the surface you use. An over-laminate can produce a glossy surface on a matte-coated paper. Besides providing protection and stiffness, the glossy surface increases an image's "pop" by giving the appearance of deeper blacks and more saturated colors. In fact, when you put a glossy over-laminate on a matte-coated paper, it is nearly identical to photo-base glossy paper. • Polyester: Used in many types of laminates, due to its dimensional stability, stiffness and resistance to heat. Typically used for rigid displays, such as prints mounted to foam core. Commonly used with adhesives that require heat, but can be found in pressures-sensitive materials as well. Polyester based laminates can range from low to high-cost, with the higher cost providing less defects and higher optical clarity. • Vinyl: Used for applications where flexibility is necessary, such as banners, or for applications where the print is to be mounted over non-smooth surfaces or wrapped around edges. Often used in pressure-sensitive materials, combined with UV blockers for outdoor durability. • Poly-carbonates: Used in specialist films with pressure sensitive adhesives. Can be as thick as 10-15 mil for extremely rigid, durable applications, such as backlit displays. When laminating, use the following tips and recommendations for best results. Using other techniques and laminate types may impact your ability to properly finish your prints. • Wait as long as possible to laminate. The longer the ink has to set on the media, the better the laminate adhesion will be. It is important that your print be dry before laminating. • Test your application. Before doing any lamination, make sure that you know how the final product will be used: indoors or outdoors, lighting conditions, etc. This will help you determine the right materials and techniques—it is always best to discover strengths and weaknesses of a system before it gets into customer hands. • Image preparation. Avoid heavy density areas that bleed to the edges of your images. Also, higher ink laydowns have an adverse effect on laminate adhesion, so the lower the ink density, the better the adhesion. • Make sure all prints and working areas are clean and dust-free. An unclean laminating environment is the worst enemy of any successful finishing job. • Follow laminate manufacturer’s instructions. Check your laminator to be sure that the proper temperatures, tensions, and pressures are being used. • Time (speed) is important because it impacts the length of the dwell in the lamination nip. • The temperature of the heated rollers must be appropriate to the materials (ink, media, films, or adhesive). • Pressure (the amount of force being applied to bond the materials together at the nip) affects the success of that bond. • Tension of the materials being laminated has a significant impact on the flatness of the laminated print. • Wipe the print with a lint-free, soft cotton cloth. This helps remove materials in the inks, which migrate to the surface of the print, which inhibit good adhesion. The longer you wait after printing, the more effective the wiping will be. • When possible, leave an unprinted border when trimming. Laminate bond to unprinted media is very good, so when the job permits, leave a white border. • After laminating, wait at least an hour before trimming. Laminate/media bond will strengthen over time and many laminate manufacturers recommend waiting as long as possible before trimming. Laminate Testing: When using a new media, it is important to take the time to test its compatibility with your lamination setup. Some adjustment of technique or laminate material may be necessary for best performance. • Trim the print. Silvering along the edges is an indication that laminate bond is weak. • Fold a corner. The laminate should fold with the print and not silver. • Roll the print several times inside and out. Look for silvering and tunneling within the print. Polyester and pressure sensitive laminates are generally weak when rolled. • Strike a trimmed edge on a table edge. The media and laminate should deform as a single piece. • Test standard shipping conditions. If you commonly ship rolled prints in a tube, do this with a test print for several days before actual customer usage. Lamination will often cause color shifts in images. This shift will be different depending on the type of laminate, the media and the ink chosen, and it will vary from a slight overall density increase to a relatively major color shift. For example, certain types of pressure-sensitive laminates which use solvent based adhesives will cause severe color shifts on many types of micro-porous papers. To determine the severity of color and density shifts, laminate a test print. Often, the shift will be slight enough to not need correction, and as long as it remains consistent, you can just factor it into the overall process of producing prints. However, if the shift needs to be corrected, a slight color correction in the original file or tweaking of the output profile will be enough to bring the color and density back to where you would like it. For critical color reproduction, it is best to build custom output profiles, produced by first laminating the profile target before it is read, thereby factoring the shift into the profile itself. Prints can be mounted, whether laminated or not, to a variety of mounting boards including, poster-board, foam board, sintra, gator board, and more. You can obtain optimum performance by applying to the following surfaces: stainless steel, aluminum, glass, acrylic, ABS, foam core, rigid PVC, or similar flat surfaces. As usual, test your specific substrate prior to actual application. Adhesive material can be added to inkjet media using a laminator. Self-adhesive media, with an adhesive backing already applied and protected by a release liner, are available as a one-step mounting solution. Self-adhesive products should be used only for applications where you intend to mount or adhere the print to a substrate. Use of these materials unmounted will cause wrinkles to appear in the liner and media. Prints should not be applied directly to textured, riveted, or corrugated surfaces. Brayer hand rollers or squeegees will help you apply the graphic smoothly, without air bubbles, to fixed surfaces. The adhesive on some self-adhesive products is permanent—removal may be difficult and may damage surfaces such as painted walls or drywall. Be sure to check the technical documents regarding the specific product you are using to ensure the adhesive type is appropriate for your application. When mounting to a mount board for outdoor applications and for maximum durability indoors, the edges of mounted prints should be wrapped to the back of the mount material. This will ensure best protection from water and moisture, and from un-peeling. To wrap the edges, leave an excess amount of either the media or the pressure-sensitive laminate outside the image area, and adhere it to the sides and back of the mounting board. If wrapping is not practical (e.g., when the print is to be mounted directly to an existing wall), consider using extra reinforcement around the edges of the print. This could include a clear tape, lacquer, clear caulk, or a wood or metal frame. This will offer the best protection against the natural peeling that may occur during the lifetime of the print, as well as protection from physical abrasion due to high traffic or vandalism. The following tips are intended as starting point recommendations. Modify these techniques to suit your applications and needs. • If you are mounting prints for the first time, practice with scrap or extra prints until you are comfortable—it may take several attempts. • Have an extra pair of hands to assist you, especially with larger prints. • Be sure your work environment is clean and that the necessary supplies are easily accessible. Supplies that are helpful are gloves, tape, cutting tools, hand rollers, a straightedge, a lint-free cloth, isopropyl alcohol or cleaning solution, canned air, and a large table or other flat surface. • First, rough trim the prints to be mounted, leaving several inches of excess media on the leading and trailing edges. • Trim your mount board to a size slightly bigger than the print and clean it with isopropyl alcohol or another cleaning solution recommended by the manufacturer. • Turn the laminator on and set the pressure and nip roller distance required for the board you are using. • Next, peel back the release liner from the media and attach the lead edge of the print to the mount board. Carefully apply pressure with your hand or with a small roller so that the media is firmly adhered to the board with no wrinkles or bubbles. • Next, feed this edge of the board into the nip rollers on the laminator. Stop the forward motion of the laminator and pull the unattached media back over the top roller. This will allow you to apply tension on the print by pulling it back as it goes through the nip, ensuring that it adheres evenly to the board. Note: With vinyl materials it is important that the media not be stretched as tension is applied—it will shrink back to its original size after mounting, causing wrinkles and bubbles to appear. • Start the laminator again while peeling the release liner from the media and pulling the print back to provide tension. This is where an extra set of hands is helpful; one person can peel the release liner while the other maintains the tension on the print. • Continue the operation until the entire print is through the nip rollers. The extra media on the trailing edge is helpful so that the back tension can be applied for the entire printed area, ensuring no defects. As you gain experience, your methods should allow you to minimize the excess media, thus eliminating waste. • With some laminators, it is possible to laminate the print as you mount. Check with your equipment manufacturer to see if this is possible or recommended. Follow their recommendations for threading the laminator. The procedure for mounting is similar, except that since the laminate is loaded on the top roller, the prints can't be pulled back over the roller and tension must be applied from the front.Once the finished print is through the laminator, wait for 1 hour before trimming the print to size. Ink and media have the most significant impact on a print's resistance to light-induced fading. However, lamination can extend your prints lifetime—often by two to three times. For increased durability, choose a laminate with UV protection. Encapsulation (completely sealing prints with both over and under-laminates) will protect your print against the harmful effects of moisture and airborne pollutants. Encapsulate with a 1/4-1/2" (6.5-13 mm) seal around the edges of a print to prevent moisture and other airborne pollutants from reaching the image. Heavier weight papers may require a wider edge seal. For increased rigidity or for larger displays, laminate the front and back with equally thick material. Wrapping mounted prints. For outdoor applications and for maximum durability indoors, the edges of mounted prints should be wrapped to the back of the mount material. This will ensure best protection from water and moisture, and prevent the media from peeling off the mount board. For more details please refer to the “Mounting” section of this document. Please note that there have been instances where the laminate and print interact in a way that limits the life of the print. Again, be sure to check with the manufacturer for the right laminate material. For a rigid, durable backlit display, laminate this type of media and mount it to Plexiglas with an optically clear mounting adhesive. A low-glare front laminate is desirable to reduce reflections in brightly-lit areas. In view boxes that already have Plexiglas in them, mounting is not necessary, and a thicker (10-mil) surface laminate may offer enough rigidity for the print to lay flat. For extra rigidity or for larger displays, laminate the back of the print with a laminate equally thick as the front material. For a rigid, durable backlit display, adhere the print side (matte side) of this media to extruded acrylic with an optically clear mounting adhesive. No lamination is necessary on the glossy polyester side of this material. In view boxes that already have extruded acrylic sheets in them, mounting is not necessary. Simply drop the laminated image between the sheets of acrylic. If desired, a thicker laminate, such as 5 mil or greater, will offer increased rigidity for these applications. Use standard techniques for stretching and framing. It is recommended that you lacquer after the stretching and framing process to avoid flaking or cracking the print. Lamination: Instead of conventional lamination, use a fast-drying spray over-laminate with UV blockers. Matte or luster sprays can be used to lower the image gloss if desired. Sprays come in aerosols and in larger containers suitable for spray gun/air compressor application. These products are intended for applications where lamination is not required. However, for increased durability and resistance to dirt and abrasion, and to retain the flexible properties of the banner media, use a vinyl overlaminate. Be aware that laminating one side can cause the media to curl toward the laminated side. Allow prints to dry before laminating. In lieu of conventional lamination, use a fast-drying spray over-laminate with UV blockers. Sprays come in aerosols and in larger containers suitable for spray gun/air compressor applications. These materials can be sewn with appropriate industrial equipment to create pockets for rope or hanging rods and for hemming. Be sure to sew image side up, so that only the back of the material comes into contact with the sewing machine foot, which can damage the surface of the media. Use a double-stitched hem with a double lock stitch, with a maximum of five stitches per inch and corner reinforcements. Use colored thread to match image content or a clear, high-strength nylon thread as an all-purpose material. To prevent corner tearing, do not stitch all the way to the edge of the banner. High tack banner tape can also be used for pockets and hems, and may be preferable if the sewing process damages the banner. Try to use rolled or low-pressure folds when creating pockets and hems as heavy creasing can crack and flake the inkjet coating. Grommets can be installed along the length of a banner through the hem so that they are through two layers of material. For added reinforcement, place corner grommets where the hems cross so that the grommets go through four layers. Use banner tape for extra reinforcement where grommets are placed if hems or pockets are not used. If wind slits are required, use horizontal slits that are placed at least 18 to 24 inches (46 to 61 mm) apart. Slits should be one foot (30.5 cm) from the banner edge. Use crescent-shaped slits with a round punched hole or added stitch at each end of the slit to prevent further tearing during use. These tips have been provided to help assist with the variety of Wide Format opportunities available. But remember, experience is the best educator. Always remember to test new materials, including inks, media, laminates, and equipment, before producing a real job.